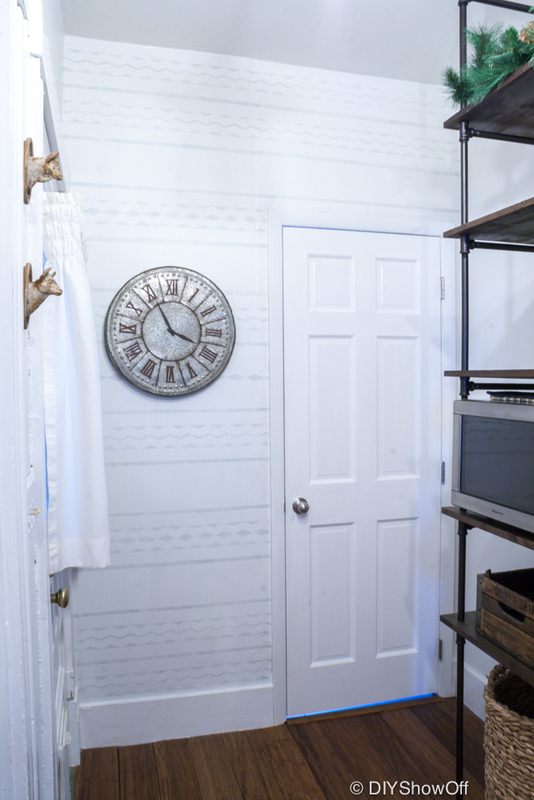 Earlier, I shared the pantry reveal and I’ve had a few questions related to one of the walls as to whether or not I used wallpaper. While I do love the look of wallpaper, I’ve had enough wallpaper removal to last me a lifetime so the answer is ‘no’. It’s paint! 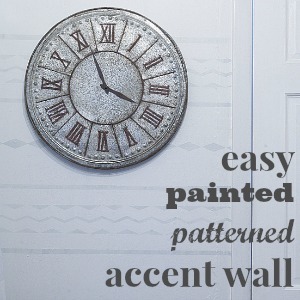 If you’re a long time DIY Show Off fan, you know that I am a big fan of using FrogTape® to create fun accent walls (see here, here, here, here) and with the addition of the Shape Tape, there are even more options for a creating a fun accent wall. I’d prefer to lightly sand and repaint than strip wallpaper in the future, wouldn’t you? My wall is small. 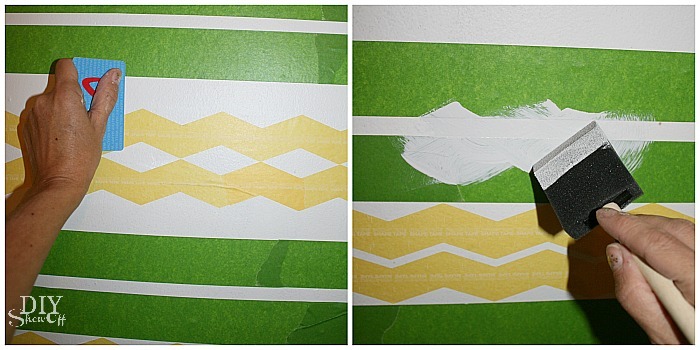 I used FrogTape and chevron Shape Tape to create a fun accent pattern with a tribal/Aztec feel. My lines were mostly “eyeballed”… but use a level and pencil if you’re more of a perfectionist. 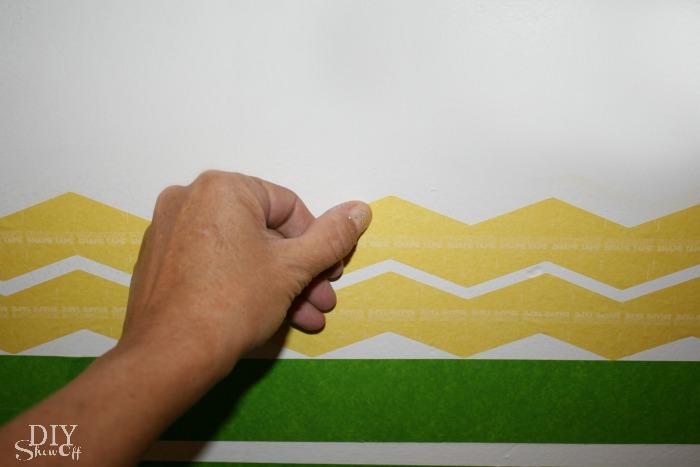 I started at the bottom of my wall space and created straight lines with the Multi-Surface FrogTape and lined it up with the chevron Shape Tape to create stripes, zig zags and diamonds…no real planning out a pattern…I just got creative working my way about 1/3 of the wall (again, no measuring). Then worked my way down from the ceiling to about 1/3 of the wall space copying the same pattern I used at the bottom of the wall. I actually painted the walls with my base color last April. It’s Valspar (Cool Grey). I didn’t want a loud bold design, so I used some leftover True Value Platinum (Old Fashioned…a light blue/gray) from our kitchen walls as the accent color. Once my tape design was complete, I used a credit card to burnish the edges of the tape as I worked by rubbing the tape edge then painting the section. I only did one coat (again, I wasn’t looking for bold results and wanted the irregularity of one coat). 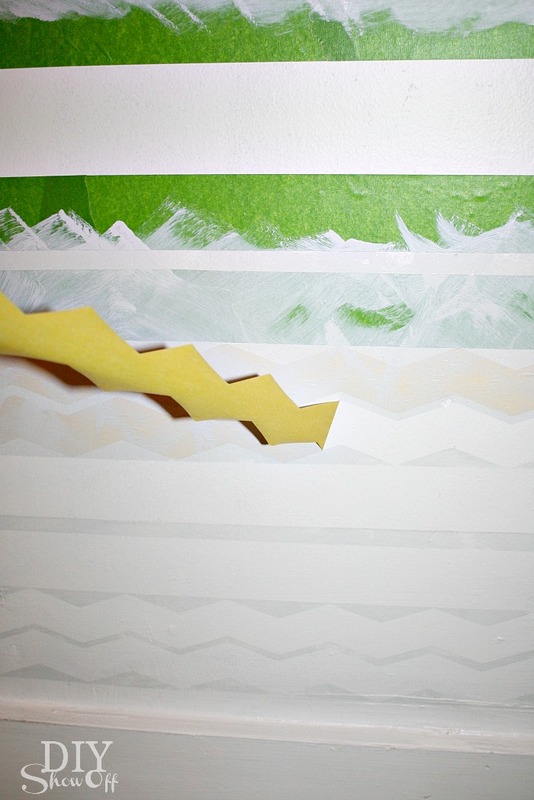 This wall is bumpy in places so just doing a light colored pattern helps to take focus off of the wall’s imperfections. As soon as I was finished painting, while the paint was still wet, I removed the tape. So within a 1-2 hour time frame, my wall had an awesome new ‘wallpapered’ look with a subtle design! I was going for a tribal or Scandinavian vibe. From a distance, it reminds me of writing paper. Remember it from grade school? 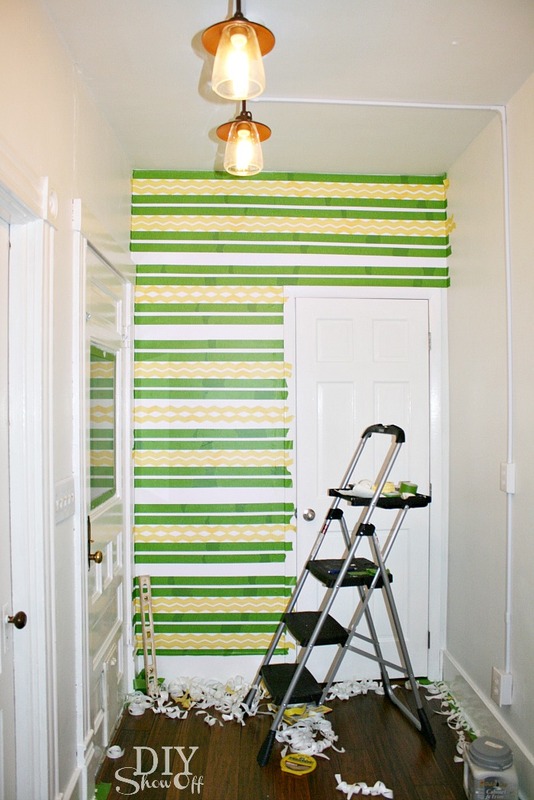 What I love about this: Cost for 1 roll of FrogTape and 1 roll of chevron Shape Tape is less than a roll of wallpaper! Use leftover paint! It’s also less time consuming and less work – all for the same look as wallpaper without the headache to install or remove plus the option to personalize colors and design. 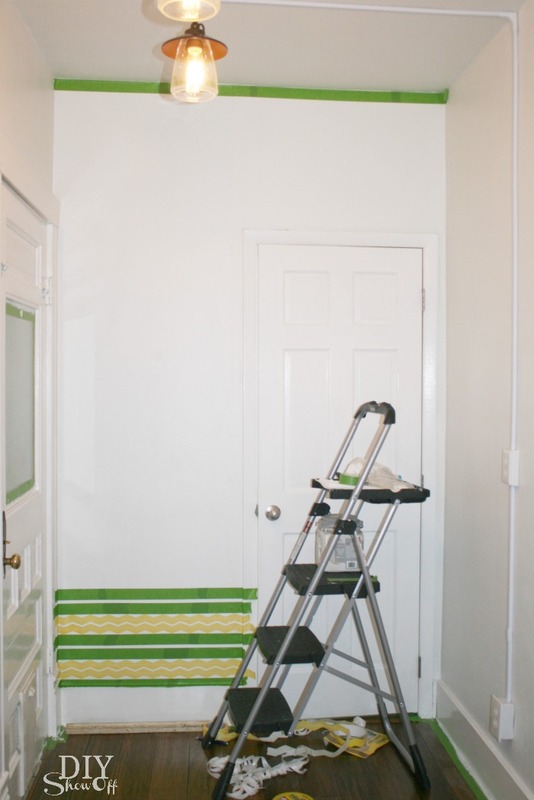 This entry was posted in Decorating, FrogTape, Home Accents, Painting and tagged accent wall, DIY, FrogTape, Painting by Roeshel. Bookmark the permalink. I just love it. And I too never want to even hear anyone mention wall paper to me ever! It is a pain isn’t it? Thank goodness above that this house had none… whew, one bullet dodged. That’s awesome! It is very subtle and I really like it. Just gorgeous and love the pipe shelving! So in love with this!! Amazing! Really, really cool! I love the look and can appreciate the attention to detail too. You rocked this one! great accent wall. I have used frog tape, but never have seen the patterned tape. love it! Love the pattern you created Roeshel… the results are gorgeous! What amazing results! I love it! I LOVE IT! Lately, I’ve been thinking about doing the same with my wall. This doesn’t look like a difficult D.I.Y, but I bet my result won’t be as nice as yours. 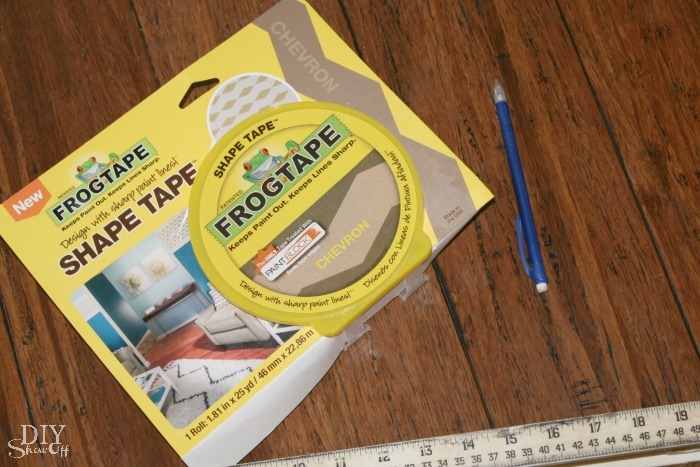 I’ve heard only good things about FrogTape, so I’m willing to give it a try. 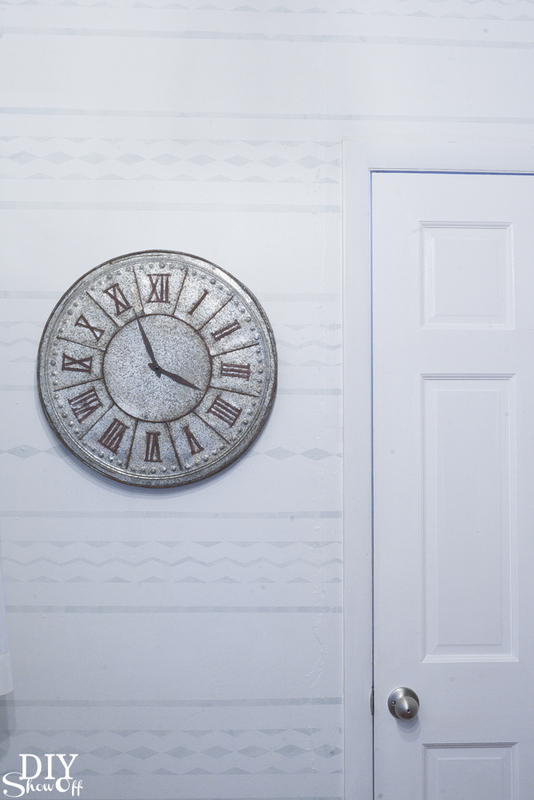 And the clock looks absolutely great together with the new wall pattern. So I know you had said you were wanting to find a place to add bead board. . I totally think you should do the ceiling in this room with it painted white! This is really cute and seems easy enough to do. Will it mess up the paint if you waited until dry before removing the tape? Thanks for sharing! Thanks, Dez! Yes, if the paint dries…it will sometimes pull away with the tape so best to remove while the paint is wet. I spread out a few newspapers and throw the sticky/wet tape on them. It makes it easy to roll up and throw away without sticking to the garbage bag. Hope that helps! Thanks so much for stopping by! Dear DIY: Feedburner says at this link “The feed does not have subscriptions by email enabled”. Thought I’d mention it. I’m enjoying all the articles, thanks!